We work with a small number of local producers who share the same vision as we do - seasonal, local fresh food. All our fresh fruit, veg and meat is English and sourced as close to our Highbury depot as possible. We spend a lot of time talking to our producers to bring you to best seasonal produce available. Each week in our newsletter we bring you news from our farmers and what they are able to bring us for that week. To keep up to date sign up to our weekly newsletter using the link on the left of the screen. Father & Son Chris & Dylan Bean run a cooperative of boats based in near Helston, Cornwall. They fish in Falmouth Bay, and fish in small day boats, using static gear and lines. Because the boats return to port each day the fish is extremely fresh. And because they use static nets and lines to catch their fish, they are far more likely to catch what they want and so their level of discards are very low. These two factors mean that their fish is as sustainable as sea-fishing can be, and we are extremely proud that they supply us. Pinney's of Orford was born in the 1950's when Richard Pinney decided he had had enough of London and headed for the countryside. He found a derelict cottage just outside Orford next to the Butley Creek on the Suffolk coast. He began to look for ways of making a living and turned his attention to the river, where he set about restoring oyster beds that had lain derelict. Oysters had been cultivated here for centuries and had a fine reputation but the trade had died down at the end of the 19th Century. He started laying down oysters from Portugal, which grew and fattened very well, and the oyster business began despite being warned by local fishermen, that if you want to lose all of your money, oysters was a good way of doing it! At the same time, being a keen fisherman, he caught some large sea trout off Orford beach. Not knowing what to do with it, he began experimenting with smoking in a disused outhouse at the end of the cottage. The results were so good that he decided to buy some salmon, and the smoking business began from there. He developed a unique system of burning whole oak logs, a system which has been refined but hardly changed to this day. The smokehouses are still situated at Butley Creek near to the oyster beds. Trout, mackerel, cod roe, wild and farmed salmon, kippers and eels are among the products that are now available through Farm Direct. The Maldon Oyster Company was first established in 1960 and was originally run as a cooperative between several local fishermen, under the leadership of Clarrie Devall. During the hard winter of 1963, most oyster beds in Essex were devastated by ice and the company became dormant for a few years, until Mr Devall started growing new stocks of Pacific Oysters in Goldhanger Creek. In the early eighties, Mr Devall took on David Coward-Talbott as a partner and they successfully grew several million Pacific Oysters on the traditional beds in Goldhanger Creek and established some small quantities of native flat oysters in the main Blackwater River. After Mr Devall’s death in 2002, Mr Coward-Talbott formed the Maldon Oyster Company with Richard Emans the partnership was set up with the sole intention of revitalising oyster farming in the River Blackwater to its former glory, this work is now continuing following David’s retirement in 2008. The Maldon Oyster Company now has a large area of the River Blackwater under their management and has re-established a native oyster fishery as well as being one of the largest producers of Pacific Oysters in the UK. One of their primary aims is to utilise this Essex estuary to its best advantage without harming the delicate eco-system and its salt marshes. For it is an area swathed in natural beauty, supports a wide variety of flora and fauna and plays an important role providing wintering grounds for many migratory birds. The area is now enshrined as a Site of Special Scientific Interest (SSSI) and is also protected and registered under the European Union’s Shellfish Waters Directive (79/923), whereby it has the distinction of being one of only a very few shell fish growing waters in the UK. Keith and Karen Hitchings, together with a small but dedicated team we have been running the successful family business of Chalke Valley Watercress since 1991. 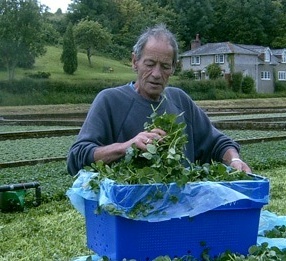 Keith took over from his father, becoming the fifth generation of the Hitchings family to farm watercress at Broadchalke. 10 miles west of Salisbury, Broadchalke is one of several small villages that form the beautiful Chalke Valley. In 1880 his Great Great Grandfather chose this site because of the beautiful spring water resource that naturally rises there, the water is filtered by the Chalke hills that form this lovely valley and provide all the natural nutrients and minerals that our watercress requires to flourish to the quality it is nationally renowned for. Many changes and improvements have been made to the site over the last 120 years; in 1976 his father was the first grower in England to pass the NFU code of practice, which they still hold today. More recently they have gained a certificate of conformity to the Assured Produce Standards scheme, and Nature's Choice. The watercress is still traditionally grown using the natural water resource that the Chalke Valley provides, but they now harvest the watercress with a mechanical harvester. In the past they sold bunched watercress to the wholesale markets throughout the UK, which finds its way to street markets, greengrocers, hotels, restaurants and catering companies. This was predominately harvested by hand, which was painful work, bending over cutting with a carving knife for up to seven hours per day. This is skilled work taking several years to perfect, however he found with the onset of RSI injuries in his wrists, shoulders, back, hips and the reluctance of new labour to harvest in the old manual way, they had to change our methods. They now grow in the same way as before, in the same spring water as before, but they now mechanically harvest the watercress loose, early in the morning while temperatures are still cool. The cress is packaged loose into plastic bags. John Hurd's Watercress, Stonewold, Hill Deverill, Wilts. Ripple Farm Organics Home Farm is a small horticultural farm of 14 acres situated in the Stour Valley, Kent at Crundale. The free draining soils, blessed by the warmer climate of the Southeast, produce exceedingly tasty veggies. As well as their Home Farm, they also rent a Victorian Walled Garden at Olantigh near Wye and fields below Wye Crown, including an old' Spartan' orchard. Ripple Farm has been certified Organic since 1989 and holds an Organic Symbol from the Soil Association. The farm itself is essentially a market garden producing a wide range of vegetables, salad, herbs and some soft fruit. Located in the heart of the Suffolk countryside next to the ancient Anglo-Saxon National Trust site, Sutton Hoo Free Range Chickens are chickens with a difference. A traditional slow growing breed, the birds roam freely on 40 acres of pasture overlooking the River Deben. Sutton Hoo firmly believes in the slow process of rearing birds in the traditional way, as such, all Sutton Hoo Chickens are completely free range. The birds live in small groups and shelter from the elements in mobile houses that have no artificial lighting and are naturally ventilated. From about two weeks of age the happy chicks venture outside to enjoy exploring under Suffolk’s vast open skies. From then on all feeding takes place outside by hand with additional nutrients foraged from the surrounding vegetation. Charles and Belinda were farmers with a mission which was to rear truly free range chicken in the Suffolk countryside they loved. Their poultry would enjoy an additive free diet without antibiotics or drugs of any kind. The birds have gained a national reputation for the quality of the product and the unsurpassed welfare. Bocaddon Farm Veal was born in 2006, when Jon and Vicky Brown moved to Bocaddon, Vicky’s family farm in Cornwall. Vicky’s brother Rob had a dairy herd on the farm but, as often happens on dairy farms, most of the bull calves were unwanted and were being disposed of at birth. Jon and Vicky decided to try rearing some calves for veal – in the open air, with a varied diet – to see if they could establish a market for this misunderstood meat. In 2008 Rob took on rearing the calves, allowing Jon and Vicky to concentrate on the preparation and selling of the meat. As well as rearing all of the bull calves from Bocaddon for veal, they were also able to make use of unwanted calves from nearby farms. We built a butchery on the farm in order to have more control over the finished product, and continued expanding slowly, picking up multiple awards and plaudits for their fantastic meat. In 2010 their lives and business were turned upside-down when Rob was killed in an accident. With no-one able to take on Rob’s enormous work-load on the farm, the dairy herd was eventually dispersed, and the last of the Bocaddon veal calves were slaughtered in summer 2011. Jon and Vicky decided to continue the work that had been started with the veal business, and we found a local farmer, Darrin Hooper, to rear calves for us to our specifications on his farm at nearby Tideford. The philosophy of the business remains exactly the same – unwanted dairy bull calves reared in small groups, in the open air and with a varied diet. Cornish calves, reared and slaughtered in Cornwall, and all cut and prepared in our farm butchery at Bocaddon. With Darrin’s help we will be sure to provide the same quality product and the same personal service to new and existing customers across the UK.